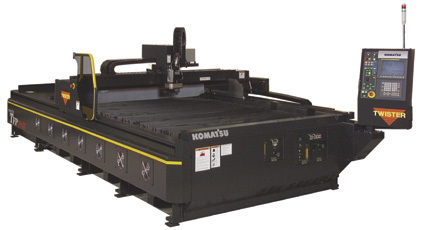 Komatsu, Rolling Meadows, IL, will introduce the Twister fine-plasma cutting machine, rated for cutting 1/4-in. mild steel at 180 in./min., 1-in. plate at 45 in./min., and 5⁄8-in. aluminum at 60 in./min., with remarkable edge finish. The machine's patented high-speed swirling assist gas provides minimal dross and optimum cut quality. Standard features include automatic setting of cutting parameters, gas selection, argon marking, and anti-patter shield. Also standard is a push-pull zoned exhaust system with sliding scrap drawers.